Obesity is a multifactorial problem. It does not only result from overeating and sedentary lifestyles but as well as cultural attitudes, genetic predisposition and lack of proper knowledge on nutrition. With the rising economy and advancing technology, people tend to depend on fast food and ready-to-eat pre-packed easy-to-prepare frozen food to beat their hunger and allot more time for other activities like surfing the internet, working on the computer, or simply watching TV after work. Combined with the advancement in technologies which gives us the accessibility of cars for transportation to go to places, even just the near ones like the groceries, church, schools, etc, and elevators and escalators instead of going up using the stairs to go to work, people spend less and less energy in their everyday lives and this means more calories stored as fats in our bodies. Lack of proper information dissemination from the health agencies makes people ignorant about the deadly consequences of obesity. Obesity is not just skin deep – it is not a superficial problem. Many obese people want to lose weight because of their appearance; little do they know that looking better is just the tip of the iceberg when we deal with obesity. Obesity is defined as a weight that is greater than what is generally considered healthy for a given height. This is measured by the Body Mass Index (BMI) which is weight in kilograms divided by the height in square meters. The World Health Organization (WHO) defined obesity as a BMI of 30 kg/m2. However, in the Asia-pacific region, a study was conducted and found that the Asian population had a comparable risk in with a lower BMI compared to the Western population, hence, the BMI cut-off for obesity in this region was set at 25 kg/m2. With a body mass index of 30 kg/m2 for the general population and 25 kg/m2 for Asians, the risk of developing other diseases increases. The diseases associated with obesity pose serious sequelae if left untreated, hence, serious action should be instituted to battle the root of these dreaded diseases which is not other than losing weight and practicing a healthy lifestyle. A lot of ways of losing the extra pounds had been introduced, but most do not address the cause of the problem, hence perished and forgotten. If you try to look how one is gaining weight and losing weight, it is as simple as addition and subtraction- that is to eat more to gain weight and to eat less and burn more to lose weight. But how you change your everyday way of life to achieve change is the harder part. With the advent of fast foods, we unconsciously eat our one whole day of caloric need with just one meal that consists of burger, fries and soft drinks. For example, in a person who is 5 feet and 5 inches, he only needs 1600 kcal to meet his daily metabolic needs. 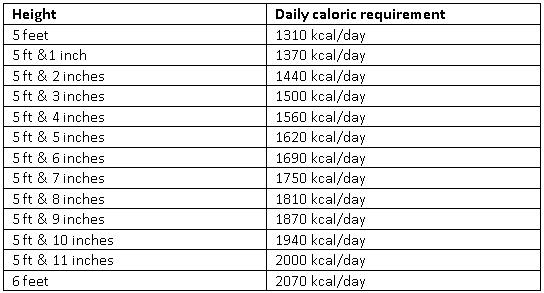 If he eats lunch and dinner from a fast food that is 1000 kcal per meal, even if he only takes coffee and 1 toast for breakfast, he is taking up at least 2100 kcal per day. That is 500 kcal per day more than his basic requirement. If he continues to do this for a month, he is expected to gain 4 pounds in one month, which is 48 pounds in one year! With weight gain, one feels heavier, becomes lazier, becomes depressed, eats more, and the cycle goes on. So how can you address the problem? It is easier said than done but it all begins with a single step. You have to start somewhere, somehow. Whatever it is, stop the cycle. Here are some ways that might help boost that long overdue resolution to lose weight. Assess your daily caloric intake. This is not as hard as you think. You can usually see the caloric content of any food just by CHECKING THE LABEL. When you go to the groceries, before you put that jar of preserved fruit or a box of cereals or a can of processed meat to your cart, check the label. The label would usually give you the total caloric content of the whole package and the caloric content per serving. Nowadays, with the government’s drive to help in the fight against obesity and other metabolic diseases, some restaurants, especially in the US, indicate how many calories one order of each of their meals contain. 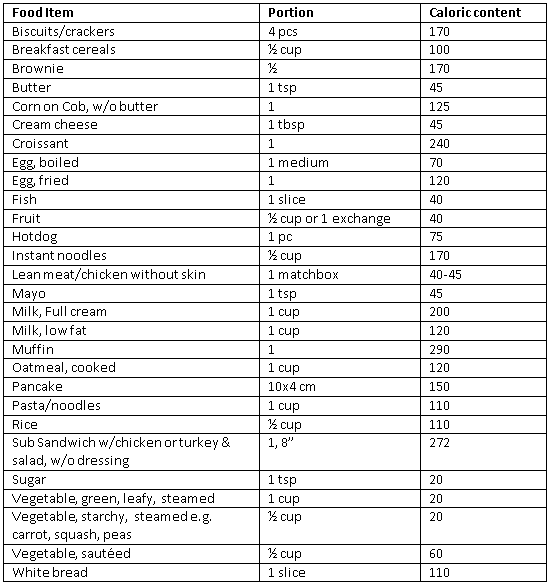 If you do not have this in your area, here are some of the caloric content of the typical everyday food we eat. 2. Know your optimum caloric requirement. Your optimum caloric requirement is usually computed based on your height and level of activity. For a person with nonstrenuous daily activity like housewives, office workers, students, doctors, lawyers, drivers, etc., here is a sample diet requirement computation based on your height. 3. Optimize your daily caloric intake based on your goal. Knowing how many calories you take in on a daily basis and the maximum caloric intake you need, you now make necessary changes in your diet. If you fall into the ideal weight bracket for your height, your goal is to maintain your weight. But if you’re underweight, you need to uptitrate your caloric intake to 500 kcal more per day to gain one pound per week. On the other hand, if you need to lose weight to achieve your ideal body weight, you need to do the reverse. That is to reduce your caloric intake by 500 kcal per day to lose one pound in one week. Once you’ve achieved your ideal body weight, you may stick to the optimum caloric intake mentioned above to maintain proper nutrition. 4. Burn the extra pounds. Now that you know how to assess your daily caloric requirement, you also need to consider burning those extra calories to optimize weight loss. As mentioned, you need to eat 3500 kcal less per week to achieve weight loss of one pound per such as by exercising, you also lose another 1 pound for that week, resulting in a weight loss of 2 lbs – which is the ideal weight loss recommended. One might consider being obese as just a cosmetic/aesthetic issue. But if you try to understand how the body functions and how obesity affects other critical organs, you would realize it is a serious problem we have to deal with. The complications of obesity stem from the basic metabolic derangement it came from – FATS. Extra calories not used by the body is diverted to the muscles and liver and stored as fats. Those that are stored in the muscle are eventually seen as subcutaneous fat that we all associate to obesity. But little do you know that the fats that are stored in the liver are as much deadly. Fats that circulate in the blood through the veins and arteries of your body react to the lining of these vessels and incite some inflammatory response. These fats are slowly deposited in the walls of the veins and arteries and through time obstruct the flow of blood. In case the body has a chance to adapt, while the major blood vessel gets blocked, there are small tributaries that are produced to compensate to the obstructed vein or artery and delivers blood through these small tributaries. But in cases of a sudden disruption of blood flow such as when a vein or an artery is suddenly obstructed by a cholesterol plaque or the vessel bursts, a bigger problem arises. A cholesterol plaque is formed when the fats deposit in an artery or a vein and forms layers of fats producing the plaque. This is a slow process and happens over time. But the disruption in blood flow that this cholesterol plaque causes when it dislodges may cause a life in an instant. This sudden obstruction in blood flow is the main culprit in the development of heart attack and stroke. Moreover, the fatty liver caused by the deposition of excess fat in the liver can eventually cause cirrhosis and liver cancer. Cirrhosis is an end-stage liver disease. It is a result of a long-standing liver problem that progresses slowly, over many years, with no symptoms, causing permanent liver injury and eventually liver failure. On the other hand, the fats deposited in the muscle and subcutaneous tissue promote the development of diabetes. The excess fats in these areas promote insulin resistance which is one of the main pathologies in the development of type 2 diabetes mellitus. Once one is diagnosed with diabetes mellitus type 2, he is going to be diabetic for the rest of his life. And this disease has many complications. It could result to blindness, foot amputations, nerve problems, erectile dysfunction, kidney problems that may eventually need dialysis, increased risk of heart attack and stroke, and the list goes on. Not to mention that if complications to the other major organs are already present, such as liver and kidney problems, one has to start on insulin injections to control his blood sugar. Although insulin is often misunderstood and patients tend to avoid getting started on insulin, it may cause inconvenience especially to people who are always on the go. These are just among the major health problems associated with obesity. With an unending list of serious medical sequelae brought about by this modifiable lifestyle and attitude driven disease, it is essential that change for a better health and better life comes from the person involved.